University of Rhode Island, Kingston, RI 02881. Research Interests: Carbon Nanomaterials, Nanomaterial for Fuel Cell, Chemical synthesis and application of Metal Nanoparticles. Research interest: NanoChemistry, Nanocatalysis, Nanoscience, nanomaterials. Research interest: Lipids, surfactants, carbon-nanotubes, graphene, gene therapy. Research interest: Ultra-fast Spectroscopy in Bio molecules and Materials, Biomimetics, DSSC, Nanomedicines, Nano-catalysis, Development of Instruments for biomedical and environmental use. Research Interest: Lanthanides and Transition Metals Doped/co-doped Materials, Lighting, Sensing and Biomedical applications, Polymers, Hydrogels, Drug Delivery. Research Interest: Raman Spectroscopy, Tip-enhanced Raman Spectroscopy, Graphene and 2D Materials, Coherent Raman Imaging of Biological Systems, Sensors and Digital Molecular Diagnostics. 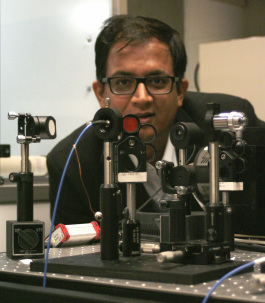 Research Interest: Nanomechanics. Molecular modeling and Finite element modeling, Blast mechanics and Impact mechanics, Design for biomedical applications, Biomaterials & Biomimetics, Computaional materials science. Research Interest: Microfabrication, Multifunctional Coatings, Experimental Mechanics, Fracture Mechanics, Dynamic Deformation of Materials, Crystal Plasticity, High Temperature Deformation of Materials, Thin Film Mechanics, MEMS. Research Interest: Polymer Nanocomposites, Fuel Cells, Solar Energy, Thin Film Mechanics, MEMS. Research Interest: Supramolecular chemistry, Micelles, Dynamic Covalent chemistry, Hydrogel, Nanocatalysis, Nanomolecule Probes. Research Interest: Advanced Functional Nanomaterials for Energy and Environmental Applications, Carbon nitrides, COFs, Mesoporous oxides, Photocatalytic water splitting, GHG storage and conversion. Research Interest: Multifunctional Nanomaterials, Multiferroics nanomaterials, Metal Oxide Nanostructures for sensor and Photocatalytic application, Micro/Nanoelectronic Fabrication Processes, Cu-interconnects, Chemical Mechanical Planarization and Clean technology, Nanobioglasses for medical applications. Research interest: Thin-films, Nanocomposites and Nanomaterials– materials, processing and characterization, Thinfilm passive components, Integrated passive devices, Device-to-package, package-to-board interconnections, Electronic systems packaging and integration. Research Interest: Physical Chemistry, Electrochemistry, Nano-Phase Material. Research Interest: Biomedical Instrumentation, Biomedical Engineering, Nano-Materials.